Some of the gems which we use in our handmade custom gemstone jewelry that are said to enhance Abundance and increase Prosperity include Blue Quartz, Carnelian, Citrine, Garnet, Hawk’s Eye, Onyx, Pearl, Peridot, Ruby, Tiger’s Eye, Topaz and Sapphire. 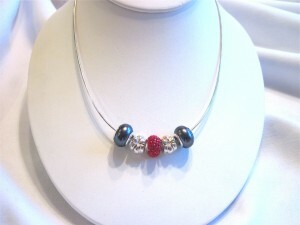 Ruby Crystal and Black Fresh Water Pearl Bead Necklace is created with a beautiful ruby crystal “large-hole” bead, sterling silver accent beads and black fresh water pearl beads. It is strung on a sterling silver chain and measures 17 inches. 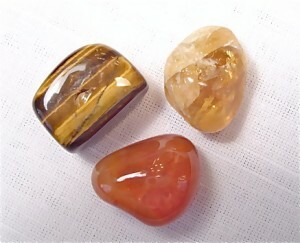 Click here for the Healing Properties of Gemstones. 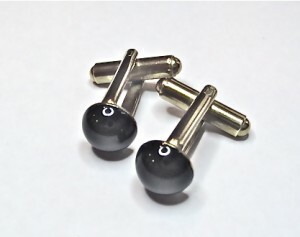 Men’s Black Onyx Cufflinks Boxed set includes two genuine polished 8mm onyx cabochons mounted on silver or gold metal cufflinks. Please specify when ordering. Fuschia Jade, Peridot, Pearl, Clear Quartz Wire-Wrapped Pendant is handmade with vivid Fuschia Jade, Peridot, Clear Quartz beads and Fresh Water Pearls and is wrapped in Sterling Silver Wire. It is strung on a Sterling Silver chain and measures 18 inches. 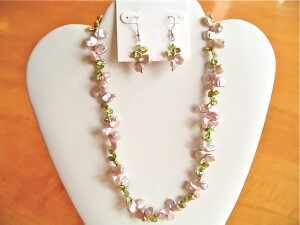 Pink and Green Cornflake Pearl and Peridot Necklace and Earring Set is handmade with one strand of lovely petal pink and soft green cornflake pearls and peridot. It is strung with a sterling silver clasp which extends the necklace from 17.5-20 inches. Matching Earrings hang 1.5 inches from the ear and are set on sterling silver french hooks. 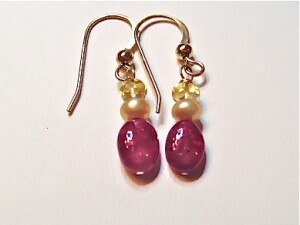 Ruby, Citrine and Champagne Gold Pearl Earrings are hand made with gorgeous rubies purchased in Thailand. The earrings are also made with faceted citrine roundels and champagne gold fresh water pearls. They are set on 14k gold-filled french hooks and dangle 1.25 inches from the earlobe. Pink Garnet, Peridot, Clear Quartz and Pearl Bracelet This lovely 2-strand bracelet is custom made with 4mm rare pink garnet faceted briolettes from Mozambique, 4mm peridot faceted briolettes, clear quartz roundels and white fresh water pearls. It is woven together to make a singe strand and has an antique gold adjustable toggle clasp which fits a wrist size from 6.5-7 inches. 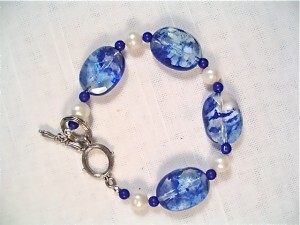 Blue Quartz, Pearl and Lapis Bracelet is created with 14×18mm oval faceted blue quartz beads, 5mm fresh water pearls and 3mm round blue lapis beads. It is made with an antique sterling silver finish adjustable toggle clasp to fit a wrist size 7-7.5 inches. Blue Quartz Earrings match the blue quartz bracelet and are created with 14×18mm oval faceted blue quartz beads, 5mm fresh water pearls and 3mm round blue lapis beads and are set on sterling silver french hooks. Sterling Silver Bracelet with Rose Quartz, Fresh Water Pearl and Crystal Beads is strung with sterling accent beads and fits a wrist size 7-7.5 inches. Compare our price to others! 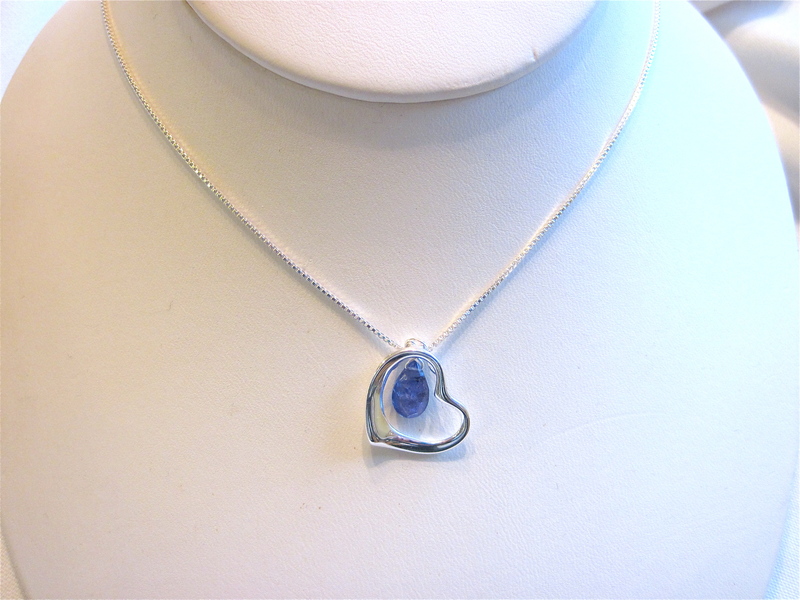 Tanzanite and Sterling Silver Heart Pendant is custom made with a single gem quality Tanzanite Briolette set inside a Beautiful Sterling Silver Heart. It is set on a sterling chain and measures 18 inches. 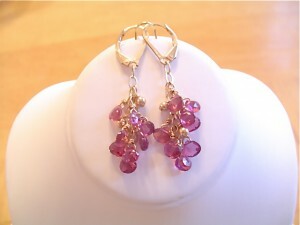 Rhodolite Garnet Briolette Earrings are handmade and created with clusters of rare and beautiful 5mm pink garnet briolettes and gold accent beads set on 14k gold-filled leverbacks. They hang approximately 1.75 inches from the ear. 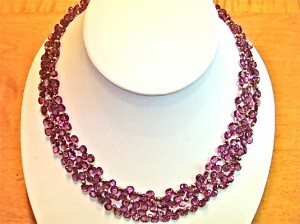 Rhodolite Garnet Briolette Necklace This stunning three-strand necklace is handmade with approximately 186 carats of 5mm pink garnet faceted briolettes. 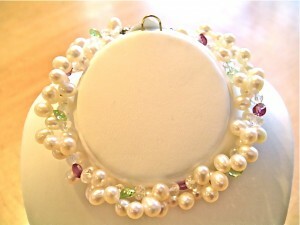 It is strung with 14k gold-filled accent beads and a 14k gold vermeil extension clasp. It extends 15.5-17.5 inches. 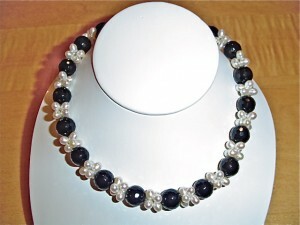 Black Onyx and White Fresh Water Pearl Necklace is a single-strand necklace handmade with 10mm round, faceted black onyx gems and 6mm white fresh water rice pearls. 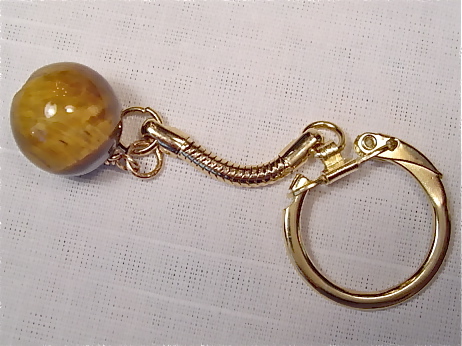 It is strung with a sterling silver extension clasp and measures approximately 17-18 inches in length. Matching earrings and bracelet are available. 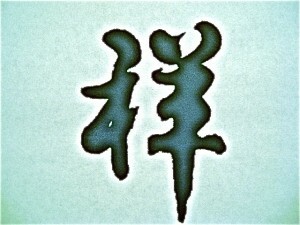 Please inquire at info@DAIKOMYO.com. 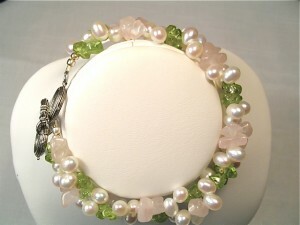 Rose Quartz, Peridot and White Fresh Water Pearl Bracelet is a 2-strand bracelet and is a favorite with our customers. 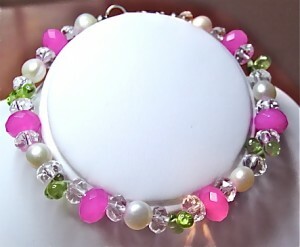 It is handmade with rose quartz, peridot and white fresh water pearls. It is strung with an antique finish sterling silver adjustable toggle clasp. It fits a wrist size 7-7.5 inches. It can be twisted for a slightly tighter fit. 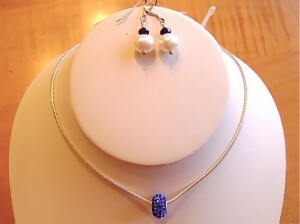 Blue Crystal Bead Necklace and Blue Sapphire and Pearl Earring Set is created with a beautiful blue “large hole style” crystal bead is strung on a sterling silver omega-style chain. 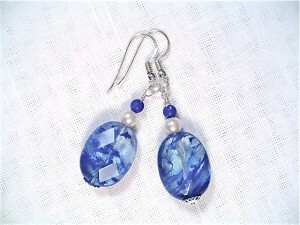 The accompanying earrings are handmade with lovely blue sapphires and white fresh water pearls and are set on sterling silver french hooks. 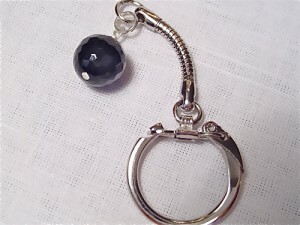 Black Onyx Nugget Keychain is made with genuine 10mm round faceted black onyx attached to a silver metal chain. Tiger’s Eye Nugget Keychain is created with a natural 15mm smooth, round tiger’s eye and is attached to a gold metal chain.